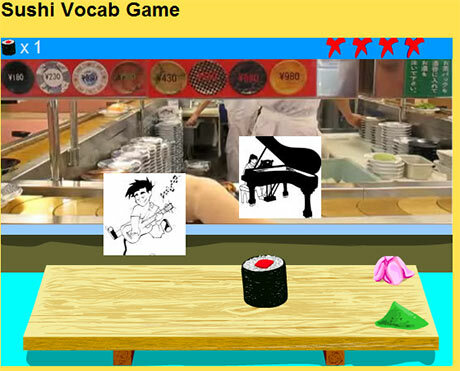 These review games use the vocabulary lists from the Beginning Japanese textbook. For sentence structure practice, try this beta version of a new game. In the Sushi review game, you are sitting at a sushi bar. When a word is said, you have to pull the image that corresponds to that word off of the conveyor belt onto your plate. The Concentration game gives you a series of cards. Clicking on the cards turns them over. You have to match the cards that have words with the same meaning. Getting a matching pair will deduct points, and you want to get the lowest score you can. The flashcards game is a simple, straightforward review.